THE TRIP FIVES: IMPROV COMEDY. NO LIMITS. And Everything Else They Produce. The College Improv Tournament - Zoiks! Represents! The College Improv Tournament ended this Saturday in Chicago. Made up of 96 teams from all over the nation it is the largest improv event in the US. Our region’s winners, Zoiks!, from Emporia University, pumped intense energy into their set and, because of the live webcast, right into my room. They came out of the gate hard and fast; hitting the stage in a flurry of scenes and jokes. At times the frantic pace was dizzying. Overall though, it was a relentless assault on reality and straight faces. This isn’t to say that they didn’t show an ability to shift gears. You could feel them settle in as they lengthened the scenes and did something they do well, finding the game – or, the hook of the scene. When Zoiks! finds the game in their scenes, they react like piranhas, devouring scene work as a unit. When they enter this frenzied state they always deliver the laughs. Their sense of play and trust is strong, and charms an audience, just as it did on Saturday. Zoiks! can shift and turn from one game to the next and keep the audience laughing. This wasn’t a hometown crowd and despite that, they connected. Zoiks! brought the heat, they did it in their own unique way and should be proud. Unfortunately, despite strong play, the day wasn’t theirs. The message I got from the judges as the tournament progressed: slow it down. The group that emerged from Zoiks! bracket, played it slow. In my opinion, it was to a fault at times. Moments were so plodding and cerebral; they lacked variance in character or energy. Some scenes became simply an exercise in making lists. However, patience was the common denominator of the finalists and theirs was a “patient” set. Restraint onstage can add complexity and richness. It allows everyone involved in the set, this includes the audience, to discover and appreciate what the group cultivates and how it is used as fuel for the scene. This has become a focus for us in the T5s; to slow down and notice the details. The transition hasn’t been easy. I wonder if at times we have entered the plodding, cerebral trap of the aforementioned group. Zoiks! reminded me of a set we played in ’98 or ’99. We shared age and energy with Zoiks! back then. We attacked the stage the same way and it felt right. The comments from the out of town improvisors were all on how much energy we had. Perhaps that is the style we have in the KC area; maybe we play spastic. Watching Zoiks! do their thing was a reminder not to lose that animal instinct. Their energy and excitement was infectious. So to the cast of Zoiks! here is a big salute from the Trip Fives. You represented the area, made us proud and showed the national scene how to play it to the hilt. Congratulations! As part of Improv Comedy on "Second Saturdays" at the Westport Coffeehouse Theatre. 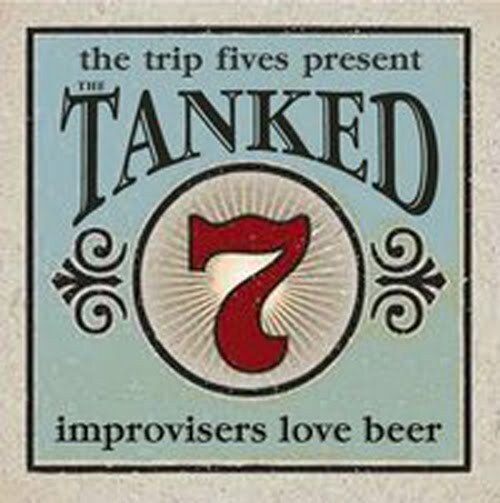 The Trip Fives, Kansas City's best improv troupe and fans of beer, will share the stage with Boulevard brewer Jeremy Danner and beer enthusiasts Trish Berrong & Bob Dusin, for a night of drinking and improv. Named Kansas City's "Best Comedy Show" in 2008 by the Pitch. 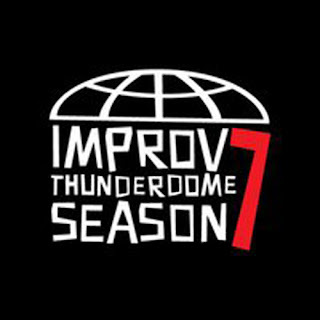 Thunderdome pits nine teams of local improvisers against each other in a four month battle. Each team will get 30 minutes to prove their worthiness. Audiences will decide each month which team shall move on to the championship match. For season six, we will again journey BEYOND Thunderdome. 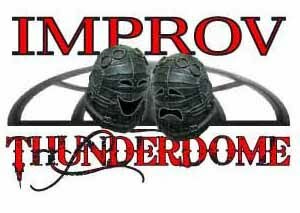 Local improvisers participated in a random draft to create nine teams of four. And then 9 coaches were randomly assigned to each team. This method is pretty straight forward and, once you sit down, it doesn't require a lot of effort on your part. The plan here is to vote for who you came to support. You aren't here to see anyone else. The best way to achieve this is to bring a distraction. This way you won't get swayed by another group. Headphones, some reading material, a head cold or even a baby would work as a proper distraction. A baby with a head cold and wearing a bib with the image of the person you support is probably best. This one comes from Rita Marks and is pretty ingenious and simple. Every time Rita laughs she marks down a tally. At voting time she simple picks the team with the greatest amounts of tallies. It's the beautiful marriage of science and improv comedy. You may even develop a system to award according to the degree of laugh you have. Like a half a mark for a giggle or two full ticks for a gut laugh. This method will require a writing utensil and a piece of paper or, a calculator watch. You might be able to get by with one of those. This is for those who like form with their function. You want to laugh but you want it wrapped in a slick package. You need to look for the structure of the set as the show unfolds. Typically you'll find the format in what gets repeated in a set. You might see something as simple as a set of scenes dissolving into a monologue that will develop material for later scenes. Others may be more complicated and attempt to tell a narrative. You'll also find that the groups may use some different edits or ways to move between characters and scenes. Does the group have smooth transitions and is the format a tool the players are using in inventive ways? Jotting down words that mark what stood out in the set can work here. If a team tells you their name and then the name of their piece... get ready to watch their format. Maybe you are familiar with improv. If so, consider this option. You know some rules of improv. Perhaps you are an Improv Olympic guy. You have read Truth in Comedy and you "Yes, and" with yourself in the shower instead of singing songs. You understand the concept of "who, who, where". Because of this you constantly take mental note of the people and places involved in your daily conversations. Or, you are more of the Annoyance type. You want to see a team that has players with bold initiations or who play fearlessly. The groups that will get your vote take care of themselves onstage and take no prisoners. You may have even heard of "Viewpoints" or David Razowski. You want to see more emotional involvement and players who follow compulsion over anything else. If this method speaks to you, you'll focus what you think is the most important or difficult of your rules before each groups set. As they play think about how well they handle that aspect. After the show, make sure you have a beer with the casts. You are either an improv geek or too uptight. In either case, beer and improvisers may help. Or not, you could be too far gone to save. 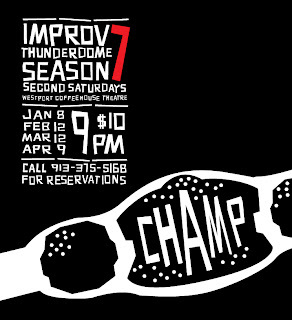 You want to buy Ed Doris, host of Improv Thunderdome, a beer. Unfortunately you are broke. Don't you fret. This one is very similar to the blind loyalty method. However, it is nobler since it will take more time and you are helping a good cause. You are the type that appreciates someone who knows what they do well and is not afraid to do it. This is why you want to buy Ed a beer. However, you are also broke. Do not fret. You just need to vote for Ed's team in both the preliminary match and the Finals. Then Ed can purchase a beer with the winnings he and his team collect from winning this summer's Thunderdome! You will have served both Thunderdome and your fellow man. I'm even sure if you told Ed that you were a number 5 type of voter at the finals after party he would let you have a sip of his beer. Well there are just a few of the ways the T5s have found to vote. If you don't find something that soothes your pre-thunderdome jitters hopefully it gave you some ideas. Here's to seeing you on the 10th! 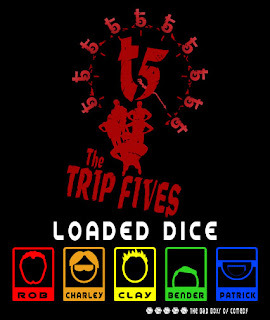 The Trip Fives share the stage with the Bad Boys of improv comedy, Loaded Dice. And when we say share, we mean SHARE. Both troupes will be on stage for the entire 90 minutes. Mixing members in a variety of improv formats. It's a safe bet for a good time. No games. No gimmicks. Just straight up improvisation. Just email trip.fives@gmail.com and you'll be added.